Lead Yoshi on a brand new adventure that will turn everything you’ve come to expect from side-scrolling games upside down! Explore a great, big world decorated like a miniature diorama in a new art style for the franchise, where each side-scrolling stage has the traditional front side as well as a flip side with different views and surprises. Look for items throughout the stage as Yoshi makes his way to the goal. You can even join up with a friend! Play as an adorable Yoshi traveling through a world crafted from household items like boxes and paper cups in this new Nintendo Switch platforming adventure. After traveling through a perfectly constructed stage, players can start at the goal and journey back to the start on the “flip side,” the backside of the course, to discover secrets. 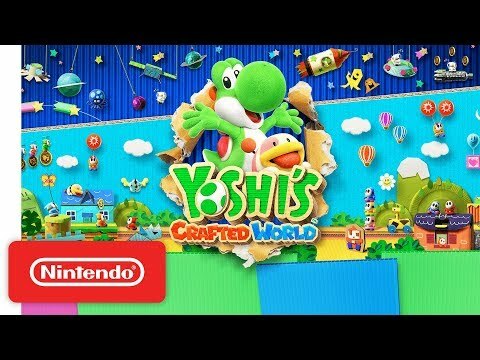 Yoshi's Crafted World was released on Switch 22d ago in the US and the UK. Based on 1 Yoshi's Crafted World Switch review, Yoshi's Crafted World gets an average Switch review score of 78.